Why A Downtown Albany, Georgia Office Location? 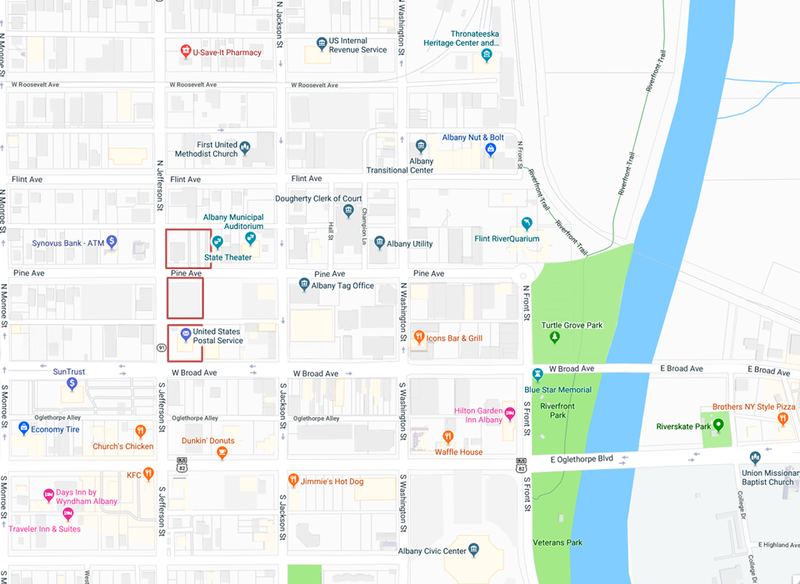 This map doesn't show the half of what Downtown Albany has to offer business, but we'll try and fill in some of the blanks below. Downtown Albany is in an ideal location for doing business. With the decline of big shopping malls downtowns are making a comeback all across Georgia and the south. Downtown Albany is close to all the things businesses need: customers, supplies, municipal services, professionals, food, recreation and entertainment. Most all businesses are co-dependant on other businesses. Whether it be to help drive foot traffic or fix a busted pipe, everybody needs somebody sometime. Downtown Albany, GA is near all these things we as business owners need. Need a business license or a permit? Licensing and permits are right in the center of downtown. Need new glass for your store front? the glass shop is only a few blocks north. Get all your banking done downtown - the original financial district - with a real live person. Need a part for your AC unit or that hard to find bolt for your vintage desk? The Nut & Bolt supply store is only a hop and skip away. Oops, you accidentally fell down the stairs and broke your ankle? The Hospital is just up Jefferson a few blocks. Got a flat tire? No problem. A garage is close by that will deliver you car to your downtown office so you don't miss any work. Rx Drug stores, Dollar Stores, safety supplies, - all these things and much more are only blocks from your downtown location. If you work you need food. If you're like us and work late you need sometimes need breakfast lunch and dinner before you even think about making it home. The downtown area has everything from fast food to full service formal dining and event space. There's Mexican and seafood at the food trucks, Soul Food at Carter's Grill, Authentic Hotdogs at Jimmy's, APD's favorite Duncan Doughnuts, Southern Fresh at The Bread House, and of course timeless dishes and breakfast at The Cookie Shop to name just a few. Downtown has something for every taste and you'll appreciate the variety of local flavor when working and dining downtown. Why drive when you can walk? Most everything you need is within walking distance when you work downtown. There's a gym/fitness center on Jackson Street. You can walk or ride bikes along the winding paved walkways and greenery of the Flint River. Floating more your speed? They have kayak landings for that. Prefer less people? Veteran's Park is just across Oglethorpe and provides the nature away from the downtown traffic. There are plenty of green spaces around to help recharge your batteries and de-clutter your mind of workday stress. We aren't talking about the big screen here. Downtown is home to the areas largest and most cultured live performance venues. Take in one of a kind performances of world famous orchestra's at the Albany Municiple Auditorium. Watch a real live production of "The Music Man" or "Elf Jr." at Theater Albany. The Albany Civic Center seats more than 10,000 people and is home to many national musical and entertainment acts year round. Before you consider any other location in Southwest Georgia you should definitely consider the perks of bringing your next business location or event to Downtown Albany, Georgia. Chances are it has everything your business needs to be successful and more. Need help finding the perfect spot for your business or meeting space? Message us your needs and we'll match you with the right space for you and your business. TM+© 2018 Lone Star Equities, INC. All Rights Reserved.